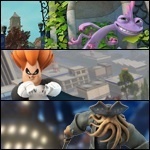 Disney Infinity Fans • View topic - Cartoonist... WRITING?! But seriously, here's the home for all my Disney fan fictions, usually Wreck-It Ralph stories, but sometimes other stuff.